14 x 7-inch Gold Star Star Drive Interior Multi Purpose Wood Screws / 110 ct 5lb Jar approx. 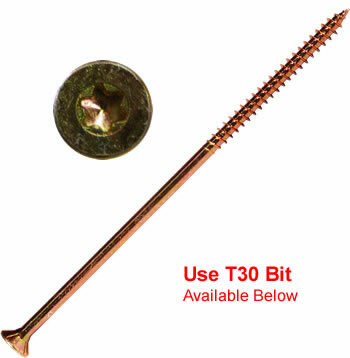 Includes Free T-30 Bit Flat head with nibs, self counter sinking, deep thread, hardened steel, yellow zinc coating, for hardwood, softwood, chip board, plastic. Available in bulk, 5lb and 1lb packages. (See our Silver Star Stainless Steel wood screws line for use with Cedar and Redwood).